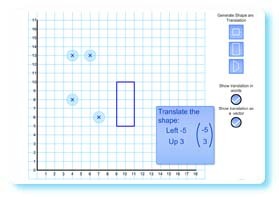 Teach the translation of shapes using this interactive whiteboard resource. Click on one of the shape buttons to the right of the grid to display the corresponding shape in a random position. A set of instructions for translating this shape will also appear in the blue box. Drag and drop the four circular markers to the translated position of the shape’s corners. If they are placed in the correct position the translated shape will be drawn on the screen. The instruction box can be dragged to convenient locations on the screen. The translating instructions can be set to words or vectors or both. Please report any errors in the comments section. I think this website is OK, but it doesn’t tell you a lot of infomation. For e.g. It doesn’t you what a translation is or how to deal with translations in your daily life. I think you have misunderstood the purpose of the site. No it doesn’t tell you a lot of information and that is not its purpose. It is a site designed to help teach students different things. It assumes that the teacher knows the concept already. The resources are to help the teacher to teach their students how to understand the concept. It is not a self study site. Hi , sorry to bother you! However, i am having a little difficulty with the homework i was given by my teacher. The thing is , i am not sure what. In the brackets i am putting a minus sign if it’s left and a plus sign if its right. I put this on the top of the bracket. Then i go to the bottom of the bracket where i put plus or minus and then the number, again all deppending on the right or left. But whenever i am to do a shape translation, and i have say…a shape on the screen…and i have to translate the shape onto its new space, by looking at the brackets given above, then i cannot seem to do it correctly. I always put the shape in the wrong place. I am really sorry yet again to bother you, but is there anyway you could help me? I’ll do my best to help as you have asked so nicely. I think you might be getting confused with the purpose of the the numbers. The one on top controls the movement left and right, the one on the bottom controls the movement up and down. If the top one is a minus number it goes left, if not it goes right. If the bottom one is a minus number it goes down, if not it goes up. The best way to do this is to pick a corner of the shape and work out where this will go. You can then use this to draw the rest of the shape or repeat the movement with the other corners and then join the dots. You can try using the resource above these comments – remember which corner of the shape you are working on and how it will relate to the other points. I hope this helps with your homework. Thank-you so much, that has helped me very much, and i will take note of what you have said for next time round. Fantastic resource – perfect to model translation! Thank you. super just what i needed! thanks!